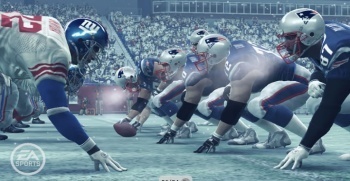 Electronic Arts has been slapped with a class action lawsuit on behalf of roughly 6000 former NFL players over its "misappropriation" of their likenesses in Madden NFL 09. Filed by former NFL running back Tony Davis on behalf of "all other similarly situated retired National Football League football players," the suit contends that EA made unauthorized use of retired NFL players in the form of "historic teams" which featured each player's "position, years in the NFL, approximate height and weight, as well as each player's relative skill level in different aspects of the game." EA attempted to avoid paying licensing fees to use the likenesses of retired players, the suit contends, by changing their numbers and other "trivial" aspects, but made the players "so close to the living player's characteristics that the consumers of the game could readily discern what player was being represented. Indeed, the value of 'historic teams' to consumers of Madden NFL depended on the composition of the teams being true to actual historical fact." Furthermore, the suit claims that while the jersey numbers of retired players are "scrambled" and their names aren't used, the game allows players to edit the historic team rosters to add the missing information. "EA further encouraged users of the Madden videogame to use the historic rosters by, among other things, in some games allowing users to achieve certain milestones in the game to unlock and use historic rosters for a reward for excelling at the game," the suit says. As usual in such cases, the plaintiffs seek "actual damages, statutory damages, punitive damages and other such relief," as well as "disgorgement of profits," legal fees and whatever else a jury decides they're entitled to. If this sounds vaguely familiar, it's because the NFL, the NFL Players Association and various retired players have been dancing a litigational waltz for some time now over licensing rights in videogames, specifically the Madden NFL series. In 2008, the NFLPA was hit with a class action suit by a group of retired players over the licensing deal it signed with EA Sports, which was "significantly below market rate" and ultimately muscled 2K Sports out of the NFL business.